I've loved Cords since I first encountered one on the streets of The Bronx. I was twelve, and so was the Cord. 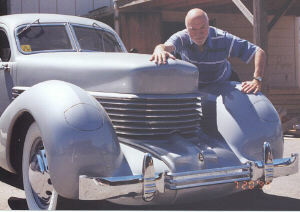 I've owned five of them since, one at a time, all 810 (1936) Westchester sedans. Sounds a bit weird today, but from 1953 to 1959 my Cords were my everyday, and only transportation. The earliest ones were cranky, leaked fluids from every pore and rain from every seam, and sometimes left me stranded in out-of-the-way places. But each one was better than the one before, and my present pride and joy, "Moonshadow", is a keeper. If you're interested in the progressive "collection" of a Cord nut, follow along . . .